Tom Barras shot to the attention of the rowing world with a fantastic bronze medal in the single sculls at the World Rowing Championships in Sarasota-Bradenton. In Florida, Barras took a number of impressive scalps, including New Zealand’s Robbie Manson and Croatia’s Olympic silver medallist Damir Martin, en route to the podium at his first senior World Championships. Barras started rowing at the age of 11 at Burway RC near Staines, under the tutelage of Jim Mathieson and has proved himself to be a great sculling talent. He has won numerous domestic titles in the single scull and has been a reliable member of the junior and under-23l teams. Barras studied Physiotherapy at Cardiff University, where he rowed for the university club under the guidance of coach Ian Shore. His first international performance came at the 2011 Coupe de la Jeunesse where he was selected to race in the men’s single scull. 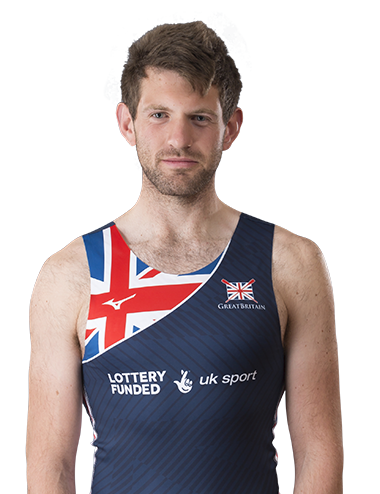 He went on to represent Great Britain at the 2012 World Rowing Junior Championships in Plovdiv, finishing 12th alongside James Rudkin. As an U23, Barras raced for Great Britain at the 2014, 2015 and 2016 World Championships – his best result was a fifth place at Rotterdam in 2016. Domestically, Barras won a bronze medal at the Glasgow 2014 Commonwealth Rowing Championships in the double scull, and claimed the BUCS single-scull title in 2015. Barras is a qualified physiotherapist and works part-time alongside training. His family live in Staines, which is twinned with Mauritius – his favourite holiday destination, because of the lovely weather and beaches. Given the chance to become any other sportsperson, Barras would choose to be Usain Bolt, who he admires for his ability to have fun without impacting on performance. If stranded on a desert island, Barras would hope to be accompanied by a decent supply of tracksuit bottoms, Coca-Cola, and his phone. He relaxes on the sofa after training by watching Les Misérables or Olympus Has Fallen, and three of his best friends would be his ideal dinner party companions. Barras is Lottery funded through UK Sport.